Enjoy full days of dance and music classes in a beautiful setting, with opportunities for rest and relaxation, spontaneous singing, music jam sessions, laughter and congenial camaraderie. Morning in the redwoods: start the day with Wake up Waltzing with The Avant Gardeners and friends. 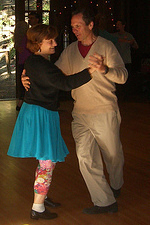 Contra Dance morning, afternoon, and night with callers Will Mentor and Erik Weberg. Relish Erik's special spicy flavor of Yes, Virginia, It *IS* Fun to Dance in the Morning, especially so with the music of Crowfoot. Sample tasty Squares and Contras with Will Mentor and Hammer and String—high energy dancing with a Southern flair. Who says Southern music isn't well phrased? Rocket Science of Dance with Erik Weberg and The Avant Gardeners. Apogee, balanced forces, centrifugal and centripetal, gravity well. It's all about those magic weightless moments in a dance where you're floating between connections. Superb! Couple Dancing with Erik Erhardt and Karina Wilson focuses on waltz, swing and Scandinavian dances such as hambo, Schottische and Swedish polska. Two callers’ tracks to hone the skills of callers, whether neophyte or touring pro. Square Dance Calling with Will Mentor offers an introduction to New England squares, Southern squares, and Western Squares—Will promises lots of time at the mike calling! Erik Weberg plans a second Callers’ Workshop covering the how-to’s of teaching a great beginner’s workshop, how to teach figures to brand new dancers, and programming for a group of dancers with mixed experience. Stretch and Flex with Certified Yoga Instructor Laura Light in the yurt. Bring your yoga mats! Bring out your artistic nature! Learn to draw landscapes with artist and art professor Will Mentor. Make baskets and other traditional crafts with Lea Smith. Before lunch, share your hidden talents: sing, dance, play, or recite for the entertainment of your fellow camper community during our Round Up gathering at the amphitheatre, coordinated by Given Harrison. Contras with Unusual Formations with Erik W.
Waltz Swap with Erik E.
Marty Brenneis, master decoder of all of those knobs and buttons, will unveil the Art of Sound. and other sessions led ad-hoc by campers! Each evening join the entire camp community for dancing with music and calling by our stellar staff. Dress up, dress down, but be prepared to dance up a storm. And if your wardrobe needs enhancing, browse through The Grand Marché Clothing Boutique for unique items to match your unique character. Party into the night with Given at The Roadhouse, or brave the darkness with stories around the fire.